Whatever strides a single museum exhibition can make in healing the wounds created on this season’s debate stages, “Paint the Revolution: Mexican Modernism, 1910-1950” — organized by the PMA in conjunction with Mexico City’s Museo del Palacio de Bellas Artes — stands as a significant overview of Mexican modern art in the first half of the 20th century and its dialogue with the contemporary art worlds of the U.S. and Europe. 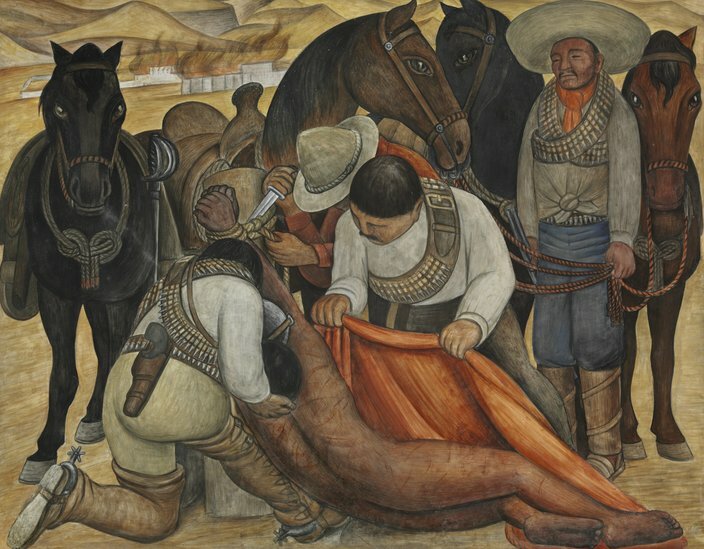 Featuring more than 250 works by around 70 artists, including painting, sculpture, prints, drawings, photography, broadsheets and digitally recreated murals, the show traces the innovations of artists like Diego Rivera, José Clemente Orozco, David Alfaro Siqueiros, Frida Kahlo and their compatriots from the outbreak of the Mexican Revolution in 1910 through the dispirited reflections of the 1940s as exiled Europeans arrived, fleeing the spreading Fascism in Europe. Somewhere around the midpoint of the exhibition are the two panels of Diego Rivera’s “Liberation of the Peon” and “Sugar Mill,” which might look familiar to regular visitors to the museum. These two frescoes have straddled the institution’s central staircase since 1943 when they appeared as part of “Mexican Art Today” – the last time such a comprehensive survey of the country’s modern art was undertaken in this country. In their usual places, however, the frescoes are sequestered behind glass and shrouded in shadows, giving their placement in “Paint the Revolution,” removed from their cases, the allure of fresh revelation. The images positively shimmer from the glints of mica in the stone on which they’re painted. But a more figurative new light is shone on them from their placement in the show, where they can be seen in the context of an evolving aesthetic, fusing the artistic and political upheavals of the day into a distinctive national style. 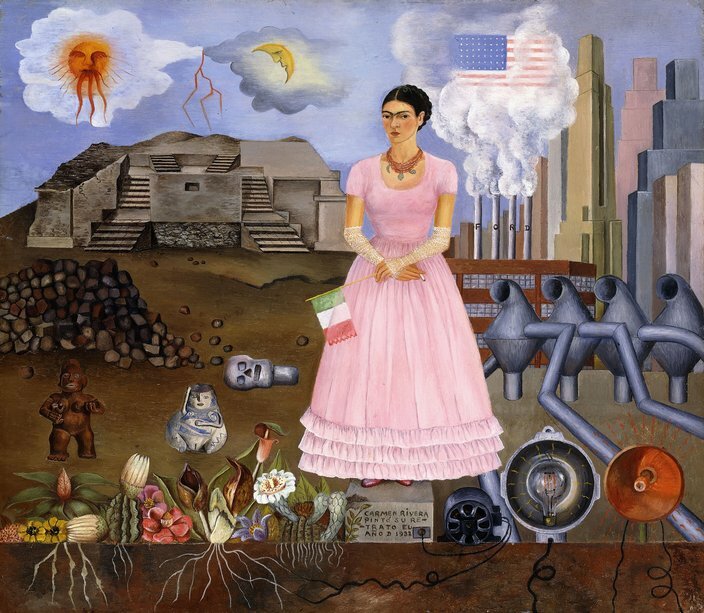 Especially in the earliest works in the exhibition, Mexican modernism’s relation to the prevailing trends in the art of the early 1900s is obvious — paintings by Ángel Zárraga, the pseudonymous Dr. Atl, and the young Diego Rivera, then living in Paris, all evidence the strong influence of Picasso and the Cubists. But even at this nascent stage, the work is simultaneously rooted in Mexican folk art traditions. That influence only grows stronger in the ensuing decades, as the armed conflict ends and the artists become part of the discussion on how to rebuild the war-torn nation. The politicization of Mexican modernism is displayed in myriad forms throughout the show, from Orozco’s satirical newspaper cartoons and Goya-inspired grotesques to an entire wall of blaring propaganda prints created by left-wing groups in opposition to Fascism. 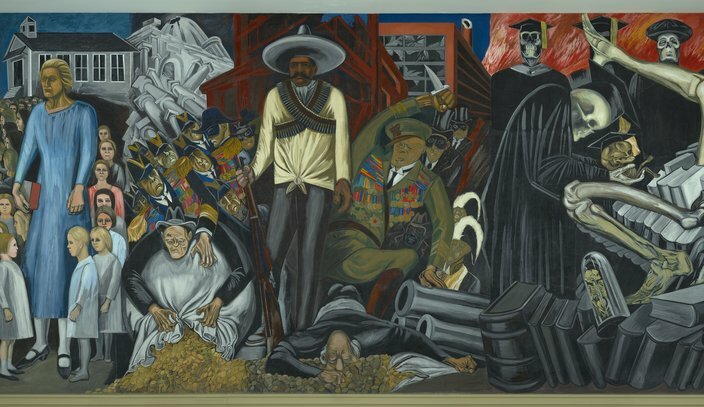 But the key component of that story is also the most challenging to translate into a traveling exhibition — the mural movement, whose best-known proponents are Rivera, Orozco and Siqueiros. The curators’ innovative approach to that problem is to devote three massive digital screens to a mural apiece by these masters, examining the works at near life size and providing interactive screens for visitors to get a closer look. By surrounding these replicas with the less grandiose art of these looming figures’ less familiar contemporaries, the show vividly conjures the full-blooded, passionate, obviously often conflicting arguments that must have been ringing in the streets of Mexico at the time, immortalized in vibrant visual forms. Ultimately the show, like most idealistic revolutions, concludes on a note of disillusionment. A new generation has arisen, influenced by the surrealists and often critical of their predecessors’ intimate ties with the post-revolutionary elite. 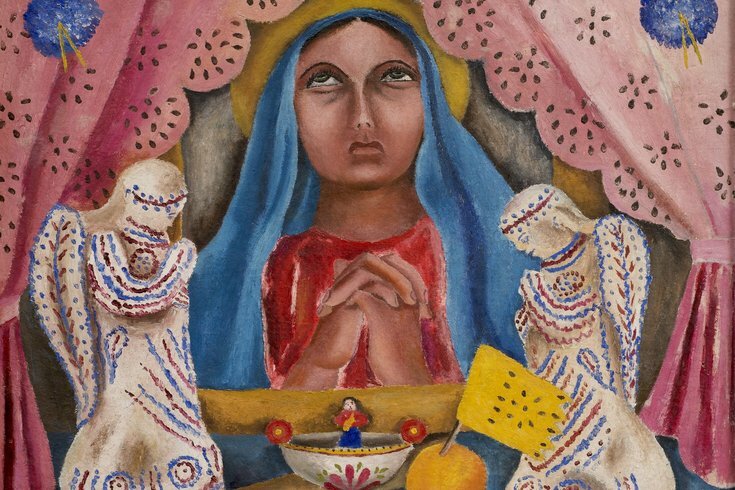 Meanwhile, these now elder statesmen are creating work of striking violence and despair — Frida Kahlo’s work in this period dwells on sadness and suicide, Siqueiros shows a monstrous demon infiltrating the church, while Orozco depicts sacrifice and martyrdom. The final impression is of the friction between impassioned vision and harsh reality, of an artistic revolution fought with more enduring success than a political one.